On Family Fun Day, the community explored Brookhaven's Science Learning Center, where hands-on activities engage children in all areas of the Lab's research. Pictured here is the Van de Graaff generator, which produces static electricity by stripping electrons off of atoms. It mimics the behavior of the larger Van de Graaffs that produce ions for the Relativistic Heavy Ion Collider! Every year, the U.S. Department of Energy’s (DOE) Brookhaven National Laboratory opens its gates to thousands of community members for its annual open house events, called Summer Sundays. Over four consecutive Sundays, the public is invited to explore Brookhaven’s biggest scientific facilities: the Relativistic Heavy Ion Collider (RHIC), the National Synchrotron Light Source II (NSLS-II), and the Center for Functional Nanomaterials (CFN)—all DOE Office of Science User Facilities. This year, the Lab welcomed more than 4,500 visitors! Each Sunday focuses on a different facility and field of research being conducted at Brookhaven. The day is filled with free tours, shows, and hands-on activities—all of which connect the community to the scientific discoveries happening year-round at Brookhaven. This year’s Summer Sundays kicked off on July 15 with a fabulous day of hands-on, family fun at Brookhaven’s Science Learning Center. Throughout the day, hundreds of families experimented with magnets, looked through microscopes, and explored nanotechnology to learn more about the Lab’s research. Visitors were able to tour the Lab’s firehouse and see the Super Scientific Circus perform “The Magic of Energy” show. Brookhaven scientist Jennifer Higbie also gave talks about the wildlife that can be found at Lab, from foxes to bald eagles. For the second Summer Sunday on July 22, the public was invited to explore ultra-small science at CFN, one of DOE’s five Nanoscale Science Research Centers. Scientists at CFN study materials that are as tiny as a billionth of a meter, with a strong focus on energy-related materials. The facility’s world-class facilities, including advanced electron microscopes and a cleanroom, were on display during the facility tour, and visitors were able try “virtual nano reality.” Brookhaven scientist Mark Hybersten discussed how nanoscientists are able to design and see such tiny materials, and children were able to enjoy “The Magic of Chemistry” circus show. 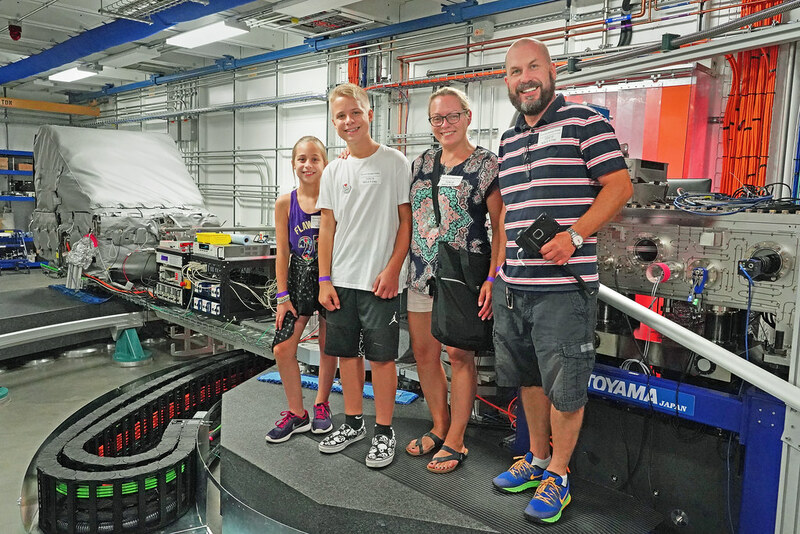 On July 29, visitors saw brilliant light and dazzling discoveries at NSLS-II, one of the world’s most advanced synchrotron light sources. Scientists at NSLS-II use ultrabright x-rays to illuminate the inner structure and chemical makeup of batteries, ancient artworks, biological cells, and more. Visitors toured the facility’s giant ring, which is big enough to fit Yankee Stadium inside! The tour highlighted some of NSLS-II’s most exciting experimental stations, some shaped like giant soccer balls and some large enough for their own building. Prismatic Magic’s Science Spectacular Laser Light Show delved into mysteries of light, color, and perception. The final Summer Sunday on August 5 was filled with atom-smashing fun at RHIC—where scientists smash atoms together to recreate the incredibly dense and hot conditions of the early universe. Visitors could see the house-sized STAR detector that captures these particle collisions, and they walked through the facility’s underground accelerator tunnel. The “hot and cold” science of RHIC was explained by Associate Lab Director for Nuclear and Particle Physics Berndt Muller, and children could try to “stump a physicist” with their questions. Mr. Fish’s Phenomenal Physics Show closed out the summer. As the major outreach event for the Lab, Summer Sundays are a fantastic way to engage and inspire thousands of people. More than 250 Lab employees volunteered for Summer Sundays this year, donating their time and energy for science outreach. From guiding facility tours and helping the Lab’s visitors to performing demonstrations and giving scientific talks, Lab volunteers take part in every piece of Summer Sundays—without their help, none of it would be possible. “The amazing staff who engage with our community in support of science help us realize our vision of simultaneous excellence in science, laboratory operations, and community service,” said Dorsinvil. Within three years of Brookhaven’s founding in 1947, the Lab began opening its doors to the public through annual open houses. The goal was for community members to meet the Lab’s scientists and support staff, and learn about the Lab’s research, discoveries, and operations. Over the years, these events evolved into the annual program the Lab now calls Summer Sundays. And each year, the dedicated efforts of the Lab’s volunteers, as well as the many support departments throughout the Lab, enable Summer Sundays, and the Lab’s connection to the community, to continue. More information about next year’s Summer Sundays will be available in Spring 2019. Follow Brookhaven Lab on Facebook for the most up-to-date information, or visit the Summer Sundays website.